Solid rivets are the right choice for a number of different applications. Featuring a solid shank on one end and a manufactured head on the other end, solid rivets are considered the strongest type of rivet for fastened joints. Even so, there can be some situations in which you may need to make alterations to a solid rivet in order for it to be suitable for your particular project or application. One of the alterations that can be made to a custom solid rivet is having the shank end manufactured with a chamfered cut-off end or a straight cut-off end. 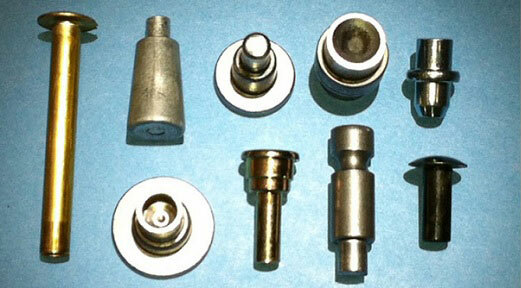 The die point of a custom solid rivet can be produced with a variety of head styles. Such head styles include round, truss, oval, universal, button, countersunk, pan, and flat. While solid rivets do offer incredible strength, it is also possible to apply a secondary heat treatment in order to add increased ductility. This may be done based on the requirements for certain applications. In other applications, it may be necessary to harden the rivet in order to increase both durability and strength. When ordering custom solid rivets, it's important to consider whether certain coating or plating options may be necessary. This usually depends on the application, and is one of the reasons that custom solid rivets are often a preferred choice. It's also not uncommon for solid rivets to be ordered with a plain finish, so that they can be painted with the correct color following assembly. Material options can also vary based on application in custom solid rivets. Among the most common types of materials used for solid rivets are copper, brass, aluminum, stainless steel, and steel, although other options may also be available. As part of the process of choosing a manufacturer to handle your custom solid rivet needs, it's important to find a manufacturer that can work with you to design a rivet that will meet your specific needs. At Universal Rivet, we frequently work with customers requiring a broad array of rivet specifications. We work one-on-one to ensure that your rivet design will include all of the features you need for the relevant application.